"On behalf of Maurice, Nancy, and myself, thank you all (Bruno and Gani to you and your staff) for the many hours that you spent vacuuming, mopping and attempting to clear the obstruction in the drain pipe. You all performed very well as we tried to remain as open as possible to our visitors' travels through the halls. The flood had little to no impact on the sleepover and that was only because of your combined tremendous efforts. Well done and thank you." ... Grant Eberlin, Director Technical Operations, Ontario Science Centre in an email sent to Gani Iyer, Senior Facility Manager and Bruno Ido, Area Manager, Eurest Services. The IO account has officially released its 2015/16 common account-wide goals. Please click HERE to view the goals on Client Insight Portal. With performance evaluations behind us, you should be working with your manager to establish your individual goals for the coming year if you haven't done so already. Performance goals help set the expectation for what you should accomplish in 2015/16, and support the broader goals of your service line, the account and the company as a whole. Individual goal setting should be in myHR no later than June 30, 2015.
Review the account-wide goals to see how you can support and help contribute to the success of the IO account. FM colleagues from across the province gathered last week to attend the 2015 FM Operations meeting held at the Queen's Park Complex at 900 Bay in Toronto. Justin Ridley, HSSE Director kicked off the meeting with a safety moment while Ryan Clayton, IO account Alliance Director provided the opening remarks. Meeting host, James Lawrence, Managing Director FM, Operations and Finance, provided a year in review along with an overview of the 2015/16 goals and themes with a focus on World Class. The two-day event was a success, allowing for information sharing across service lines. Earlier this year, Human Resources held its second annual Management Practices Training, facilitated by Kimberley Cox, H.R. Director and Wayne Murray, FM Director, East Region. Recently promoted and/or new managers were invited to attend this interactive training session. Topics of focus included regulations and legislation, making the right hire, as well as promoting employee satisfaction and productivity through effective leadership and the RISE values. The Management Practices Training was a result of feedback received from the account's 2012 Employee Satisfaction Survey. The survey identified areas for improvement such as management effectiveness and demonstration of the RISE values. The Management Practices Training was positively received by all attendees, with 100 per cent of the material being regarded as relevant and 85 per cent of managers feeling more confident in their capacity to manage and lead employees. Important to note is that the 2014 Employee Satisfaction Survey results improved, with the largest impact made around "environment", specifically satisfaction in management increased by 6 per cent. H.R. will continue to hold these annual sessions for new managers on the IO account with the goal to continually improve management effectiveness and employee workplace satisfaction. The IO account Strategic Sourcing team held their fourth annual Supplier Recognition Awards ceremony last week with 29 vendor companies in attendance. 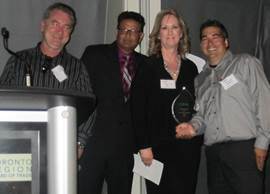 Eleven awards were handed out during the event, cohosted by Dominic Roopnarinesingh, Strategic Sourcing Director for the IO account and Bart Santamaria, Manager Procurement and Contract Management for the IBM Canada account. Also in attendance was Jeffrey Brown, CBRE Vice President Sourcing Solutions from Atlanta, Georgia. Reflecting on 2014, the cohosts noted that CBRE utilized the services of 3,100 vendors across four major Canadian accounts of RBC, IO, United Technologies and IBM for a total of 76 million square feet (minus data centres), and 330,000 work orders. Ryan Clayton, IO account Alliance Director underscored the importance of such events to recognize phenomenal service and show appreciation to CBRE's trusted vendors. "Our clients expect CBRE to raise the bar and not become complacent. We lean on our supply chain to help us out and partner with us to come to the table." Nick Munaretto, Senior Vice President, IO Asset Management was in attendance for the event. The Infrastructure Ontario account honoured five of its key suppliers for their outstanding contribution to CBRE while IBM honoured six. These suppliers showed excellent partnership with CBRE by providing exceptional service above and beyond the call of duty, as well as aligning themselves with and embracing the CBRE R.I.S.E. Values. The Supplier of the Year award was determined using the account's Supplier Performance Module (SPM) in Ariba in addition to evaluating a supplier's commitment and cooperation to the overall success of CBRE on the IO account. The recipient of the award in the non-technical category was Commissionaires while the recipient in the technical category was Direct Fire. Dominic Roopnarinesingh thanked the winners for supporting CBRE and for all the work they do as CBRE's success would not be possible without these strategic partnerships. You may also unsubscribe by calling toll-free +1 877 CBRE 330 (+1 877 227 3330). This disclaimer shall apply to CBRE Limited, Real Estate Brokerage, and to all other divisions of the Corporation; to include all employees and independent contractors ("CBRE"). The information set out herein, including, without limitation, any projections, images, opinions, assumptions and estimates obtained from third parties (the "Information") has not been verified by CBRE, and CBRE does not represent, warrant or guarantee the accuracy, correctness and completeness of the Information. CBRE does not accept or assume any responsibility or liability, direct or consequential, for the Information or the recipient's reliance upon the Information. The recipient of the Information should take such steps as the recipient may deem necessary to verify the Information prior to placing any reliance upon the Information. The Information may change and any property described in the Information may be withdrawn from the market at any time without notice or obligation to the recipient from CBRE. CBRE and the CBRE logo are the service marks of CBRE Limited and/or its affiliated or related companies in other countries. All other marks displayed on this document are the property of their respective owners. All Rights Reserved.